1. Cut a 10x10 inch square. 2. 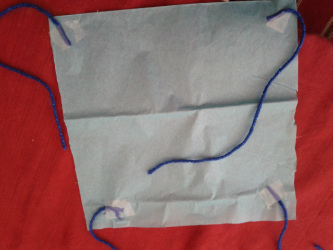 Now tape the blue yarn to each corner of the tissue paper. This will be the outside of the parachute. 3. Tie the action figure to the ends of all 4 pieces of the blue yarn. Gravity pulls the parachute down, but as it falls, the canopy traps the air in it. The trapped air pushes against the canopy, making the parachute fall slowly. 1. Try making another parachute with an 8x8 inch square. Now drop both the parachutes down at the same time, standing up on a achair/table. 2. Which parachute falls down first? Did you know that the first recorded parachute jump was in 1797? Andrew Garnerin jumped from 8,000 feet high in hot air balloons. Garnerin also designed the first air vent in a parachute intended to reduce oscillations.